Been really busy uploading Obama pics. Once again, i decided to shoot at 35millimeter . I was really looking for a different shot when I snapped this image. 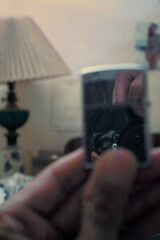 Was hoping to catch a reflection of my eye in the Zippo lighter that you see me holding there. So I just went and continued shooting other stuff.... which I'll upload later in the day. When I downloaded the images....... I COULDN'T BELIEVE IT !!! There's the poster in the background of a model.... and in the upper right hand corner of the lighter is the reflection of my fingers in a unique position. You MUST click on the picture here to see this larger.